Make gatherings memorable with ever-trendy farmhouse seating. 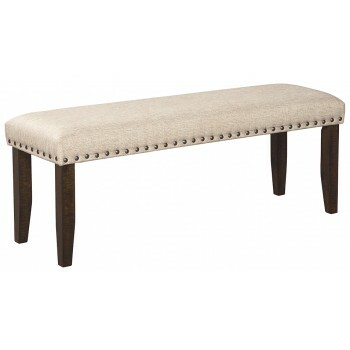 This dining bench keeps things cozy with light brown textured fabric and a cushioned seat. Punctuated with nailhead trim and the beauty of natural wood grain legs, this urban farmhouse piece is sure to impress come mealtime.